A casualty of THQ and the 38 Studios implosion, Big Huge Games has been resurrected by original founders Brian Reynolds and Tim Train. Just in time for Halloween, a game studio has been brought back from the dead. Big Huge Games, which was founded by Firaxis alumnus Brian Reynolds and three other game designers in 2000, was part of the 38 Studios debacle that resulted in all of its employees being laid off. After a brief stint at Epic Games, the studio was shuttered again in 2013. Now it's back, thanks to the Big Huge Game trademark going up for auction in Rhode Island, with original designers Reynolds and Tim Train at the helm. Game Informer is reporting that the newly resurrected Big Huge Games has partnered with Nexon and has more than two dozen employees working towards the release of its next game, the Civilization-inspired mobile strategy title DomiNations. According to Reynolds, the game "covers the sweep of human history... You move through the ages and build wonders of the world, make alliances, and rule your kingdom." 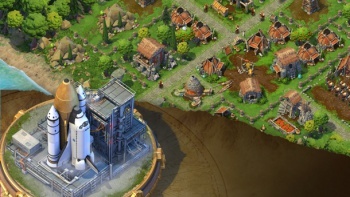 DomiNations is also reminiscent of Clash of Clans, but Reynolds clarifies, "We think of it as this developing new genre, and we have certainly taken some inspiration, but we don't think anyone has done a 'sweep of human history' game in that genre yet." Big Huge Games found success early on with Rise of Nations, and joined THQ in 2008. The now-defunct mega-publisher jettisoned Big Huge Games in 2009, at which point it joined 38 Studios to develop Kingdoms of Amalur: Reckoning. Despite the studio's poor luck over the last half-decade, this looks like a fresh start for Big Huge Games. The first game of the revived studio will be available for iOS and Android in 2015.